Leong has started learning Keyed Sheng in 2003, initiated by Mr. Lai Qi Lin. In 2005, Leong participated in Malaysia’s National Chinese Traditional Instrument Solo Competition <Yue Lang> and has won the second prize. He has become the student conductor of the Chinese orchestra of his alma mater Tsun Jin High School and managed fair amount of performances during his term until 2008. Leong has taken a different path to study architecture in Kuala Lumpur Infrastructure University College from 2009 to 2012. 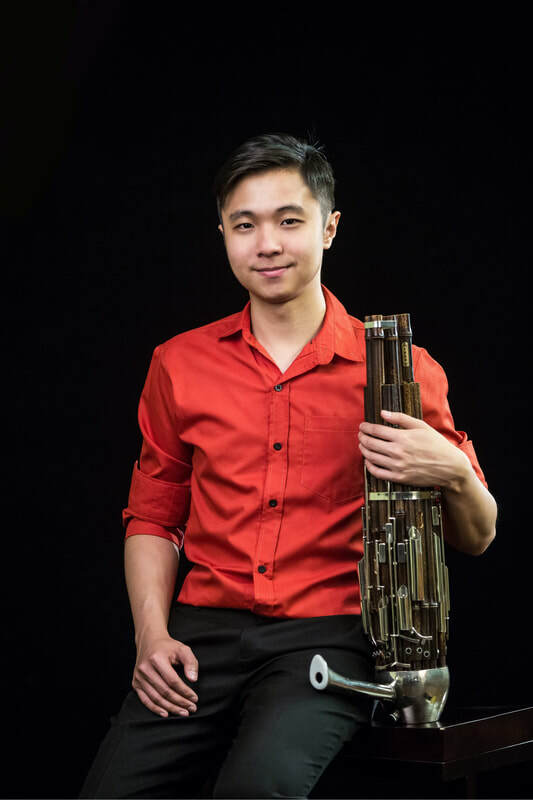 ​In 2013, with strong interest to Sheng and outstanding musical talent, Leong was successfully admitted with scholarship sponsored by Shanghai Municipal Education Commission into Shanghai Conservatory of Music(SCM), mentored by Prof. Xu Chao Ming and Mr. Wu Wei and start to learn Chinese Traditional Sheng. In 2015, Leong has participated in the Summer Gala Concert organized by the International Student Office of SCM and performed <Zigeunerweisen>, the performance was well received by the audience. Apart from soloing, Leong also indulges himself in rearranging music, he has successfully rearranged a grand scale Chinese-Western Fusion Orchestra of Molihua（茉莉花）, which includes Chinese Orchestra, Western instruments, vocals and choir, performed in the Christmas New Year concert organized by the International Student Office of SCM. He also rearranged music pieces for the musical program for the 60th Anniversary of Tsun Jin High School in July 2015. Actively participating the consecutive 4 days of the Sheng Festival Week of Shanghai Conservatory of Music in year 2015.Playing the role of host,helper and performer. Successfully organized “The Wind Blows - Leong Ching Chiang’s Sheng Solo Concert” in the Academic Music Hall of Shanghai Conservatory of Music on 27th May 2016. Won the silver prize of the youth category for traditional Sheng in 2016 “HongFuBei” International Art Chinese Sheng.